Looking for a USED W1203R2? 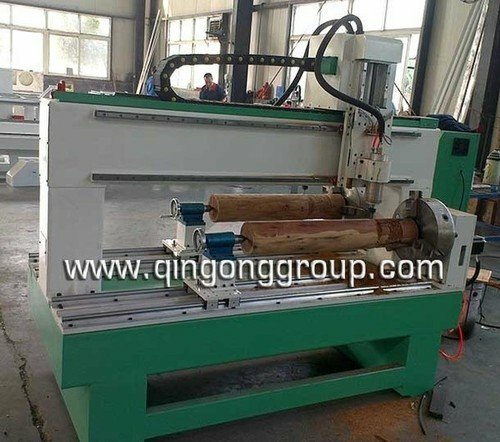 This two heads cnc wood router is design for cylindrical product processing, it is a professional gravure cylinder engraving router with machining diameter up to 300mm and processing length up to 1200mm, which is dedicated for carving and milling on all cylindrical wooden materials and cylindrical foams. The two heads can work at the same time enhance productivity, also can just choose only one to work if needed. Rotary engraving: Making relief on cylinder items, stair rail, handrail, desk or chair legs, tea-tray, the human body, avatar, buddha statue, etc. 1. 360 degree cylinder working: expands the application of CNC carver and satisfies the demands in furniture and gift making industry. 2. Cylinder materials is fixed by chuck thought three holders, force exerted uniformly and effectively and center positioned accurately so that the working accuracy is guaranteed. 3. Engraving cylinder’s diameter and length can be customized. 4. Bi-directional orienting guides provide high positioning accuracy. 5. Restoring function enable the machine continue t work after sudden stop, such as accident tool breaking. 6. Heavy steel structure make the machine works high stability. 8. High accuracy Taiwan TBI ball bearing screw, minimize the slit. 9. Auto lubrication system, ensuring machine's precision and service time. 10. This type is suitable for cylinder working. Qingong Machinery is a professional CNC machine company, who produce and export CE approved cnc router, cnc laser, cnc plasma machines, spare parts and related products. These cnc machines are very helpful in woodworking, stone carving, advertising, mould making industries and so on. Looking to Purchase a New QINGONG W1203R2?